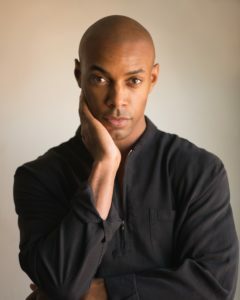 Our December pick for the PBS NewsHour-New York Times book club, “Now Read This,” is Casey Gerald’s “There Will Be No Miracles Here,” a memoir about attaining — and then questioning — the American dream. Become a member of the book club by joining our Facebook group, or by signing up to our newsletter. Learn more about the book club here. Below are questions to help guide your discussions as you read the book over the next month. You can also submit your own questions for Gerald on our Facebook page, which he will answer on the NewsHour broadcast at the end of the month. Spoiler alert on questions further down. 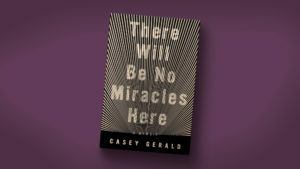 Where is the title, “There Will Be No Miracles Here,” drawn from, and why? Early on in the book, Gerald writes that in our society, people who are addicted to fame and money are perceived as just “a little lower than the angels” while people addicted to drugs are “down below waterbugs.” How does he make clear early on that this won’t be a typical rags-to-riches memoir? Gerald’s religion plays a big role in this book. At one point, he argues that in today’s world many people believe themselves too brilliant or too secular to believe in God, which he attributes to a kind of “anti-hope.” What does he mean by anti-hope? What do you think of his argument? Following in the footsteps of his father, Gerald tries out for the high school football team, makes it to varsity, and then sees intimately the injuries and sacrifice the game requires. He writes that it’s no wonder that football is America’s favorite pastime, and that he learned “how far you can make it in America if you have enough disregard for your personal welfare.” Do you agree with this statement? Gerald describes growing up in the blighted South Oak Cliff neighborhood of Dallas, in a childhood characterized by absent parents, drug use and disability checks. But while many believe that people are defined by their circumstances, he says we are actually defined by running from them. How is this true for him? Is it true for you? “There Will Be No Miracles Here” begins, as did our earlier book club pick “Educated,” at the supposed end of the world at the turn of the millennium. On its face, the two memoirs share certain similarities, following the narrators from a difficult childhood to an ivy league school. But sharp differences quickly become clear. How do these two books diverge? What did you make of Gerald’s relationship with River? Why do you think it didn’t — or couldn’t — work out? Gerald writes: “You never know what you need to know when you need to know it.” Do you agree? What can you do with instruction after the fact? When Gerald leaves his Dallas youth behind to go play football at Yale, he writes that he quickly learned that the word “network” is the defining word of today. Relatedly, he writes that the real American dream is not about finding success through working hard, but about knowing the right people. Do you agree or disagree with this statement? When Gerald describes forming the Yale Black Men’s Union, he also writes that “every grand purpose grows from personal pain,” and that meaning and ideals often follow. Have you observed this to be true in your own life? Which “purposes” of your own have begun with personal pain? When people tell Gerald as an adult that he is the embodiment of the American dream, he smiles and says “thank you.” But he writes that he should have cried. Why? Of all the critiques Gerald makes of the American dream in “There Will Be No Miracles Here,” which do you find most important? How does this book particularly resonate in today’s political, social and economic realities? At the end of the book, what does Gerald learn, both from the death of his friend Elijah, and his last visit with River? What do you make of the book’s closing lines?